Every day there are many orders placed and processed. The management at the Order Grid in the Magento database are very risky and time-consuming for admins’ work since they have to delete order one by one. The Mageplaza Delete Order extension makes it more convenient for the admin - either manually or automatically - to help them delete orders easily with a single or bulk delete command. Also, admin will receive an email notification when Order is Delete by schedule. From the Admin panel, go to Stores > Configuration > Mageplaza > Delete Orders. Select Enable = Yes to enable the module. An Order can only be deleted automatically by schedule when and only if it satisfies all the conditions of Purchase Date, Order Status, Customer Group, Store View, Shipping Country, and Order Total. Set the schedule for delete order daily, weekly or monthly. With Daily, the schedule runs automatically by date. With Weekly, the schedule runs automatically on every Monday. With Monthly, the schedule runs automatically on the 1st of the month. By that time of day, the schedule will be run automatically. Enter the period to apply to delete order before it. For example, Period = 10, today is December 31st, 2018, all orders created before December 21st, 2018 will be deleted (if they meet the conditions below). Order Status: Select order status to be applied Delete order. All Countries: Check all Orders. Specific Country: Check for orders with Shipping Address at Country selected. Order Total less than: Limit the order’s Maximum Value to apply to delete order. 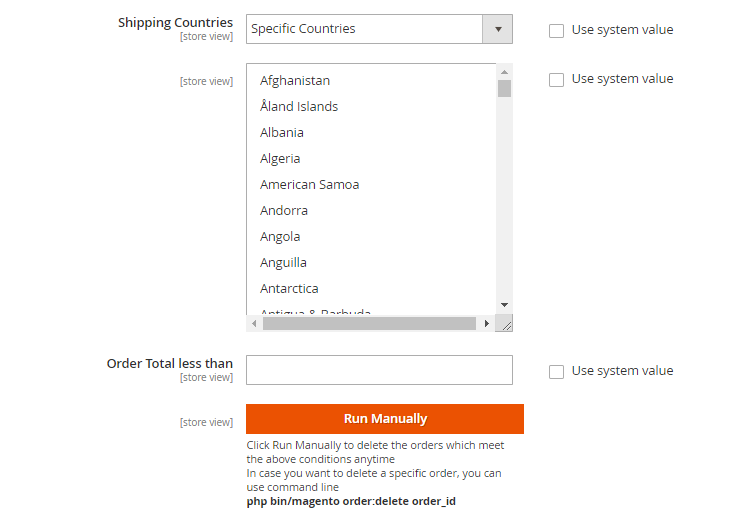 Note: Admin can also delete orders by using the command line php bin / magento order: delete order_id. For example Admin wants to delete the order with ID = 15, admin on the command line running the command php bin / magento order: delete 15. 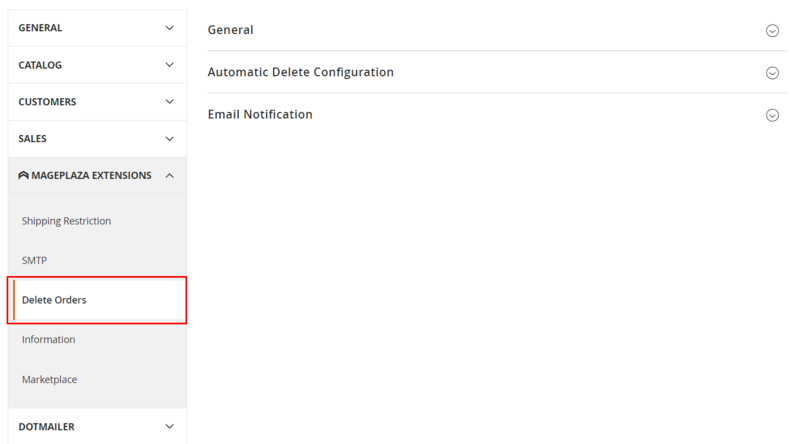 Enable: Select yes to enable email sending to Admin every time an Order is deleted (including manual or auto-deletion). Sender: There are 5 default types of Magento Sender for Admin to choose: General Contact, Sales Representative, Customer Support, Custom Email 1, Custom Email 2. To change Email Template, Admin can create another Email Template in Marketing > Email Template. Instructions for creating new Email Template here. Insert the email who receive notification when Order is Delete. Each email =must be separated by commas (,). 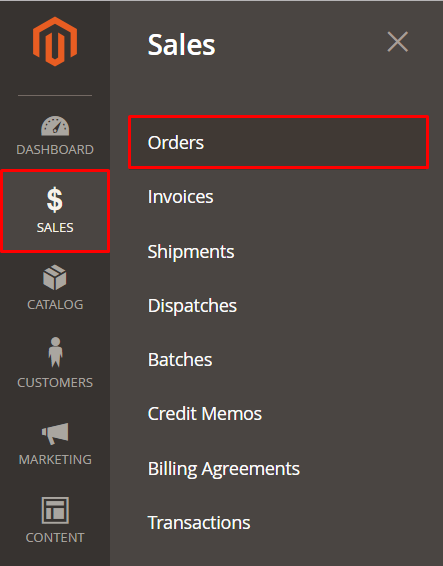 From Admin panel, go to Sales > Orders. 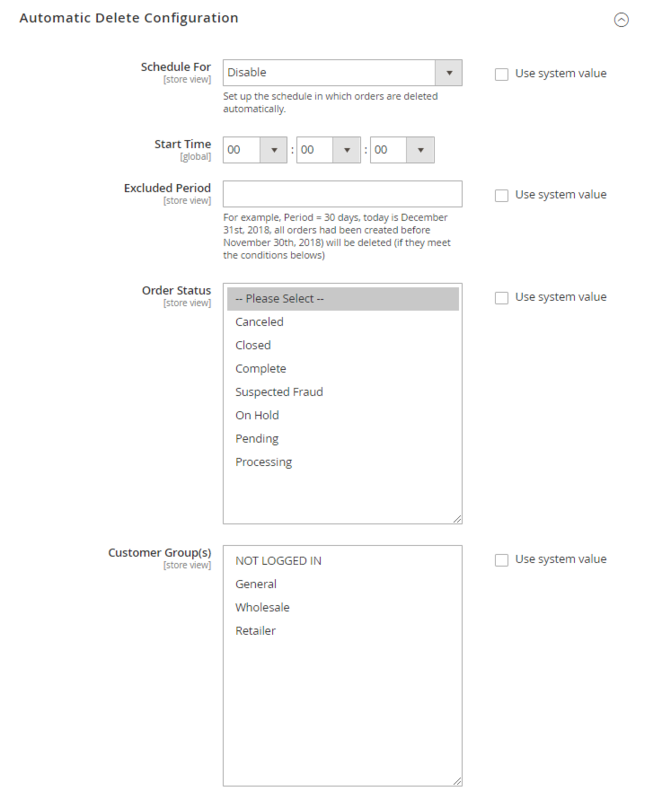 In case Admin wants to delete all order, click Select All, the system will select all created orders. After Select order, admin click Action > Delete to delete order. Also, Admin can delete order by clicking to View of the order.